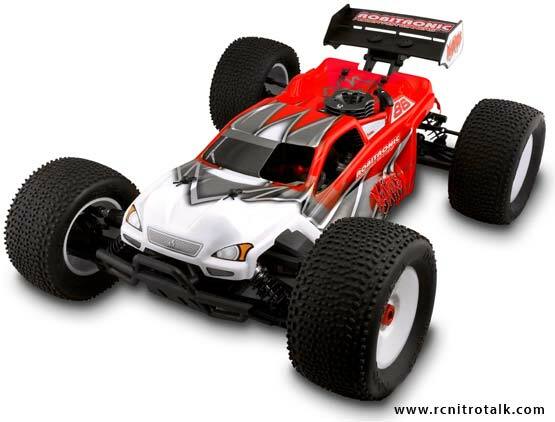 Robitronic is proud to announce the release of the Mantis RTR 1/8th scale racing truggy. The Mantis truggy was designed to meet the needs of all levels from beginner to racer. 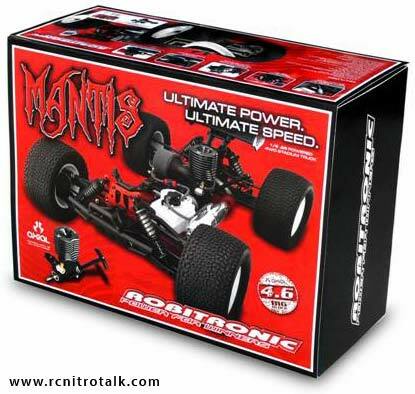 The Mantis truggy was made to be ultra durable on the track, easy to handle and maintain. Features like floating gearboxes, a sealed center gearbox, all the suspension and tuning options you will ever need, and a powerful Axial 4.6 big block help set this truggy apart from the rest of the pack. Use of new materials and intelligent design ensure that the Mantis Truggy is built to last and capable of competing on the track. Mantis â€“ the new name in 1/8th scale off road. The Mantis Truggy comes pre-built, with factory driver set-up, multi-color printed body, and includes an AM radio system with a high torque steering servo and a mini-receiver. The tires are pre-glued on lightweight dish wheels. The kit includes all Allen wrenches, a multi socket wrench, glow-plug igniter, and a 500cc fuel bottle, the only thing left to buy is batteries and fuel! The Axial 4.6 big block engine is extremely powerful. With a super-size heat-sink you will never have issues with high temperatures and overheating. A high-flow dual stage air filter protects the engine from contamination. Tuning and adjustments are simple and you can have the Mantis Truggy up and performing in a short amount of time. The Mantis Truggy engine is equipped with a pull start system, so no need for an expensive starter box. The Mantis Truggy polished tuned pipe is very lightweight and has been tuned to the engine for maximum power. Axial is an established name in the marketplace so support is only a call away if needed. The Mantis Truggy chassis was designed for an ultra low center of gravity, to be lightweight and have maximum suspension travel. 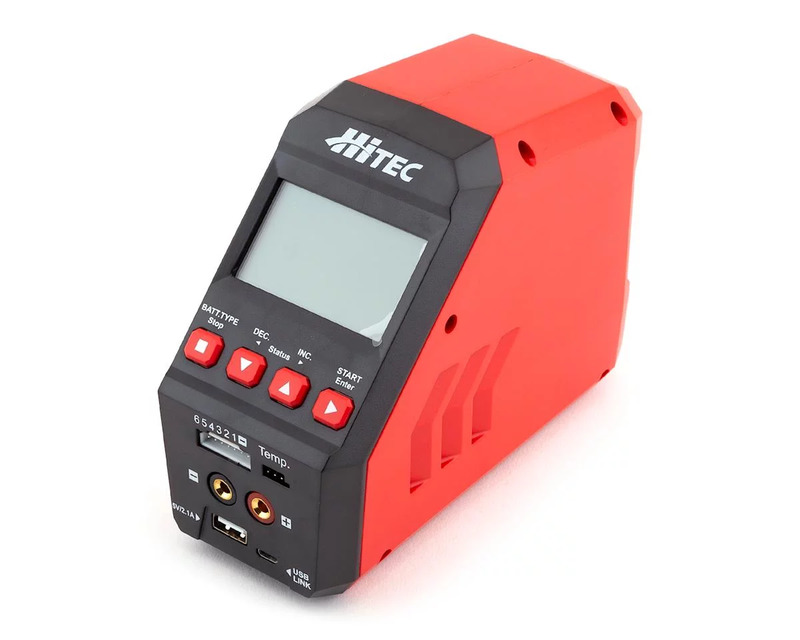 The result is a very easy handling chassis right out of the box and with all the options for setup you can fine tune it to your driving style and track conditions. Long oil-filled 14mm piston aluminum shocks with 3.5mm shafts and super strong composite suspension arms let the car fly over bumps and jumps. The heavy duty aluminum shock towers are strong and allow multiple shock positions for further tuning. All the Mantis Truggy suspension pins are supported in rubber bushings; this elastic connection avoids damage to the suspension during severe use. The Mantis Truggy has three low profile differentials all with a 6 hardened metal gears. The aluminum-top deck is ultra low further adding to the low center of gravity. The Axial Mantis Truggy body is low for maximum air flow around the engine. All this adds up to a strong performing chassis with performances advantages you can feel right out of the box. The Mantis Truggy offers a wide range of tuning adjustments so that you can fine tune your truggy to any driving condition. All important suspension points are easily adjustable. 36 possible shock positions available to fine tune your suspension. Spring-clips for adjustment of ride height. The Mantis Truggy has been designed for easy access to all important components of the car. All 3 differentials are within easy reach; if you need to access them simply remove 4 screws. he engine and pipe assembly can be pulled out by removing 4 screws. Reaching the steering and suspension adjustment points require removal of only a couple screws each. For more information visit Robitronic or join the discussion about the new Robitronic Mantis Truggy in our Truggies forum.